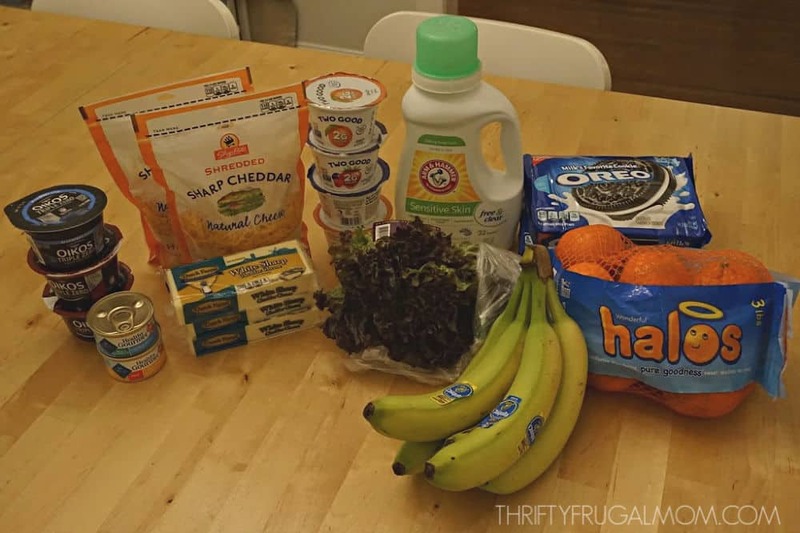 Curious how I shop on a low grocery budget? Here are all the details of my $225 a month grocery shopping trips. I’ll show you exactly how I save money and help my family of six live well without spending a lot. Some of you have wondered where I get my printable coupons. Here are the main coupon sites that I use: Coupons.com, Smart Source, Red Plum, Ibotta, Fetch Rewards (use code GEOEG at sign-up for $2.00 in points! ), Checkout 51 and Saving Star. Manufacturer websites and Facebook pages are also great sources. 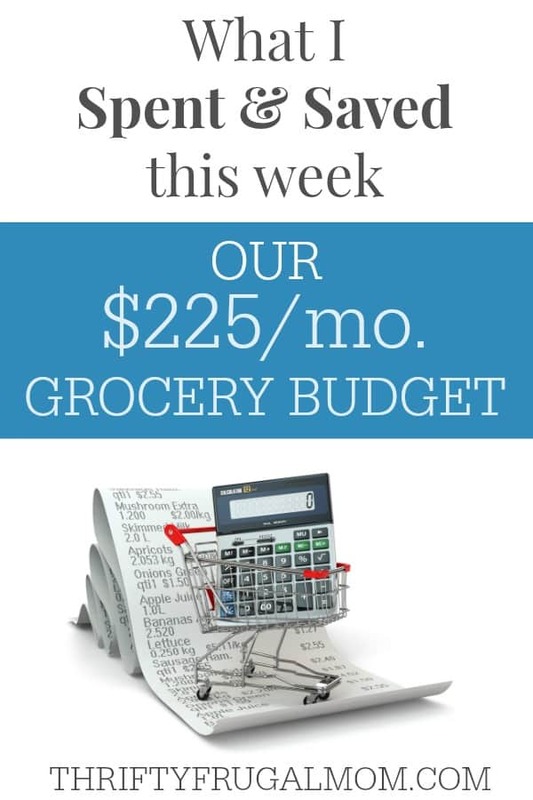 Before I dive into the actual details of this week’s budget grocery shopping trip, I feel like there a few things that I should clarify about the way that I grocery shop, just so this post makes more sense. * It pretty important to understand a bit about how I shop. I do something called stockpile shopping. This simply means that when I see an item at rock bottom prices that I regularly use or know that I can use, I’ll buy several of it. This might seem kind of crazy, but it honestly saves me hundreds of dollars a year! Simply put, by buying 6 bags of frozen veggies when I can get them for $0.50/bag with a coupon and sale instead of paying the full price of $1.50, I save $6.00. This savings adds up pretty quickly! Want to know more about this kind of shopping? Check out my post on How to Start Building a Grocery Stockpile. This is also why just by looking at the things I purchase here it might look a little strange and hard to imagine how I actually create decent, balanced meals. But remember, I have a small stockpile of lots of pantry, freezer and even fridge items that I purchased previously when they were a great price and I’m pulling from them to create our frugal menus too! * I also buy a lot of meats and veggies in bulk. The meat I either can or freeze and then obviously have it on hand whenever I need it. I purchase large quantities of fruits and veggies when they are in season and I can get them at really great prices. By canning or freezing them, I save a lot and we are able to enjoy great produce for less cost all year long. I do still buy some fresh fruits and veggies too. * I live in an area where most grocery stores fully double all coupons up to $1.00. So anything $.99 or above will double, which is why the $0.75 coupons you see below note that they doubled to $1.50. This definitely helps me get better deals, although I have to say that even before we moved Philadelphia and I shopped at stores that didn’t fully double, I still often got very similar deals. So getting great deals still is possible even without fully doubled coupons! * The Load to Card coupons that you see mentioned below can be found on the grocery store’s website when you create an account with your store card. I think most major grocery stores have this option any more and it’s a great way to save a little extra. I typically just go into my account and clip all the coupons, that way if I happen to buy something that I hadn’t planned on buying and it had a Load to Card coupon available, I’ll get the savings. And that has happened quite a few times! To get the most savings, you can also combine a manufacturer coupon with a store coupon and/or coupon app offers from places like Ibotta, Fetch Rewards (use code GEOEG at sign-up for $2.00 in points!) and Checkout 51 when available. Now that we got those details covered, let’s get down to the specifics of this week’s shopping! First of all, I plan to make a trip to Aldi tomorrow and get these sale items: chicken drumsticks for $0.69/lb., grapes for $0.99, 3 lb. mandarin oranges for $2.69 and 1 lb. organic spring mix for $3.49. I also will buy some chocolate chips, brown sugar and carrots. I would typically also buy a gallon of milk, but I bought a bunch of milk when we were in Maryland over Christmas since it’s half the price that we pay here, and froze it. So I’m going to just use that for our milk this week instead. Also, I realize that all the numbers below can get kind of confusing. I try to break it down in a way that is easy to understand, but I know that it’s still kind of hard to follow sometimes. So if you have questions, please feel free to ask in the comments! 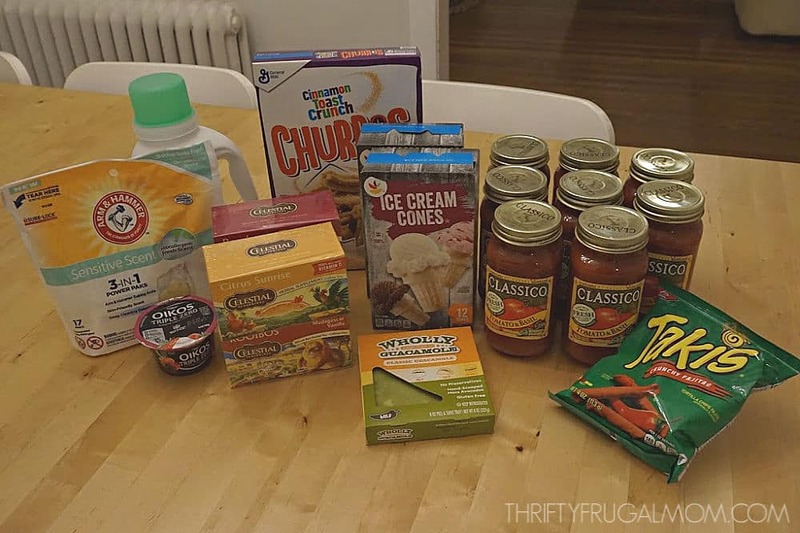 Basically, I got ALL the groceries that you see below for just $34.42 total, after all coupons and savings! That’s over $100 worth of groceries for less than $35! You all, this is why I feel like it’s worth my time to use coupons. This is roughly how much I save each week and there is no other way that we’d be able to eat as well as what we do and keep our grocery budget this low. These Giant deals will be good through 2/9/19, so if you shop before that, you should be able to these same deals yourself. The Classico pasta sauce and Celestial Seasoning tea were part of Giant’s gas rewards deals. The Celestial Seasoning tea was $0.50/box after coupons and sales. My husband loves to drink hot tea and we were actually getting kind of low, so this was a great time to stock up! The Classico ended up being just $0.09/jar after coupons and sales. I used to make and can my own homemade pasta sauce, but the last several years I’ve been able to regularly get the Classico brand for free or very close to free with my couponing. So I took that as my sign to free up some time and stop canning my own! I’ve actually been really happy with the flavor and ingredients in the Classico sauce too. The Cinnamon Toast Churros were totally free after coupons and sales. We usually have baked oatmeal or homemade granola for our breakfasts. But when I get cold cereal for free, the kid’s are always excited! They love to add a little on top of their granola and occasionally, if it’s a sweet kind like these Churros, we’ll eat it as our dessert. The Wholly Guacamole was $0.25, the Takis were totally free (they don’t look good to me, but my husband thought they seemed interesting), and the ice cream cones were a special buy to use to make a birthday cake for my daughter this week. The Arm & Hammer detergents were both free too. I usually make my own homemade yogurt, but when I can get it free at the store, I will. The Oikos was actually better than free this week after coupons and sales. In fact, I made $0.50 on it! These ShopRite deals will be good through 2/9/19, so if you shop before that, you should be able to these same deals yourself. You’ll have to excuse the awful lighting in the picture! I usually grocery shop in the evening and of course it’s totally dark till I get back home. Obviously, our ceiling lighting just does not provide great lighting for photos! I try to buy cheese when it’s $2.00/lb. or less, but the last couple of years, that has become more difficult to consistently do and often I end up buying it when it’s $2.25/lb. or even $2.50/lb. (Shredded cheese freezes really well, so I stock up when I can and freeze it.) I was getting low on shredded cheese, so I was super excited when I saw that I could get two pounds this week for $2/lb.! Have you ever noticed those coupons that sometimes print out of a little machine at the register? Well, they’re called Catalina coupons. Recently, one printed at ShopRite and it was for $1.00 off a cheese purchase of $3.99 or more. So I used that coupon this week to get a great deal on the Dutch Farms 8 oz. cheese. By using the coupon along with the sale, it made the blocks of cheese just $1.00 each, or $2/lb. The Oreos were $1.50 each after coupons and sales, which is a pretty great price for them. I don’t use Oreos a lot but I do like to have them on hand for when I make Frosted Chocolate Chip Cheesecake and a few other desserts. I usually try to watch for good sales and then freeze them until I’m ready to use them. The Oikos were free and the Two Good yogurts were a money maker of $0.82 after coupons and sales. The Arm & Hammer detergent and Blue Buffalo canned cat food were both totally free. And no, we don’t have a cat. 🙂 But when I can get pet food free I do, and then I have fun sharing it with friends that have dogs or cats. The clementines, bananas and lettuce were all things that were good prices or that we needed. I was able to use a Catalina coupon to save $1.50 on my produce purchases, which was pretty nice! One other thing that I wanted to mention was that I got a rain check for Arm & Hammer detergent pods. I should have been able to get them for free as well by using a printable coupon and digital load to card coupon just like I did on the liquid detergent. Unfortunately, they were out of stock. But that’s where rain checks become super helpful! I went to customer service and they wrote me a rain check for the product since it was out of stock. The rain check will allow me to buy the detergent pods and get the sale price even after the sale is over. That means, next week I should be able to use the coupons along with the rain check and get the detergent pods for free then. I get rain checks a lot when a sale item is out of stock and I highly recommend it. It’s just one of the many things that help me make this whole low grocery budget work! As we say in Maine, Wowsah! Don't have deals like that around here, but I am applying your techniques to the sales we do have. By the end of the year, it will be interesting to see how much I have saved. (I keep track of how much we spend every month.) Many thanks! I love the Maine response, Laurie! :) And I also love that you are figuring out ways to apply these techniques even without the same kinds of stores and deals. I would love to know how much it saves you at the end of the year! Hopefully a nice little chunk, right? I also shop to maintain a stockpile. Wouldn't shop any other way. Couldn't afford to do so. Forty two years. Wonder how much savings that adds up to? Forty-two years? That's amazing! And I wonder too how much saving that would add up to! I often wish that I could know exactly how much this way of grocery shopping has saved us. My husband and I just had a little discussion after I read your comment and we're pretty sure that in the 12 years that we've been married that this method of shopping has saved us at least $36,000. I'm guessing you are far beyond that!! Loved this post, I have found that the one major step in being frugal was meal planning. Yes, it does really help a lot!